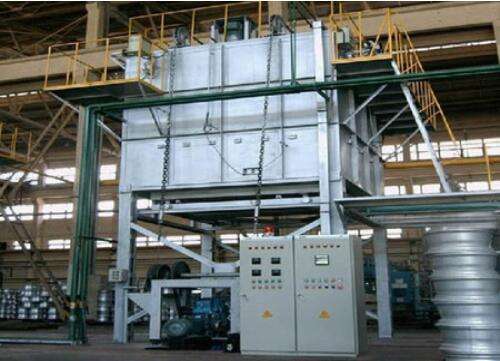 Aluminum quenching furnace is composed of heating furnace cover and mobile chassis. A square (or circular) top of the furnace is equipped with a crane, which can be hoisted to the hearth by chains and hooks. The furnace cover is supported by steel sections and the bottom has a pneumatic (or electric) operated door. Under the hood of the chassis can move along the track, positioning, chassis containing quenching sink above and baskets. The temperature uniformity required by users is ensured by the design of circulating fans, wind guide covers, hearth structure, distribution of electric heating power, arrangement of electric heating elements, control mode and process, door structure and so on. System of advanced design, component selection and quality, manufacturing quality assurance. Mechanical system operation is smooth, reliable, the equipment is in low noise, low vibration working condition. Reflected in 100 ~ 650 ℃ can achieve precise temperature control, the system is stable and reliable, easy to operate, to avoid human error, full-featured and so on. Furnace bottom open furnace door, double speed lifting mechanism, advanced mechanical system, making quenching transfer quickly and reliably, the time can be based on user requirements.